The United States Possessions Philatelic Society Exhibit Award will be presented for (a) the best single-frame and (b) the best multi-frame exhibit of U.S. 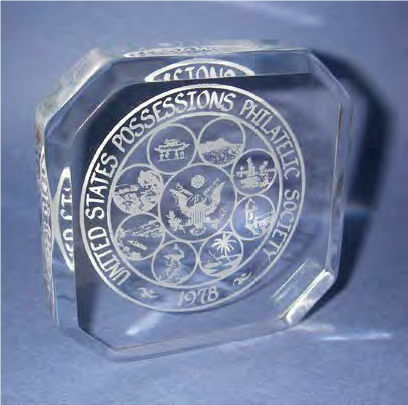 Possessions related* stamps or postal history at any "APS World Series of Philately" Shows at which the USPPS has a recognized presence (in the sole discretion of the USPPS Board) and the exhibit receives at least a show Vermeil award. The purpose of this award is to promote the research and exhibiting of U.S. Possessions material to further our understanding and enjoyment of U.S. Possessions philately. The award will be presented only once for the same exhibit, i.e., modified or upgraded exhibits will not be eligible if they have previously won the USPPS award. (A list of previous award winners will be provided prior to the show.) The awardee does not have to be a USPPS member. A copy of the requirements of this award are available for your convenience. Just click the Download button for a copy in PDF format.